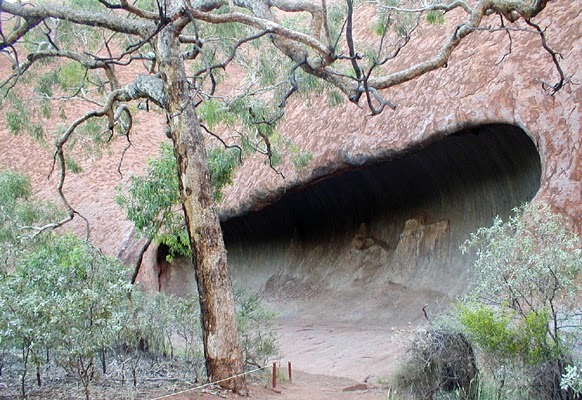 I assume this cave in Uluru has been formed by the action of the wind. French Expression: De bon poil = chirpy/chipper/in a good mood; en forme = in good health. 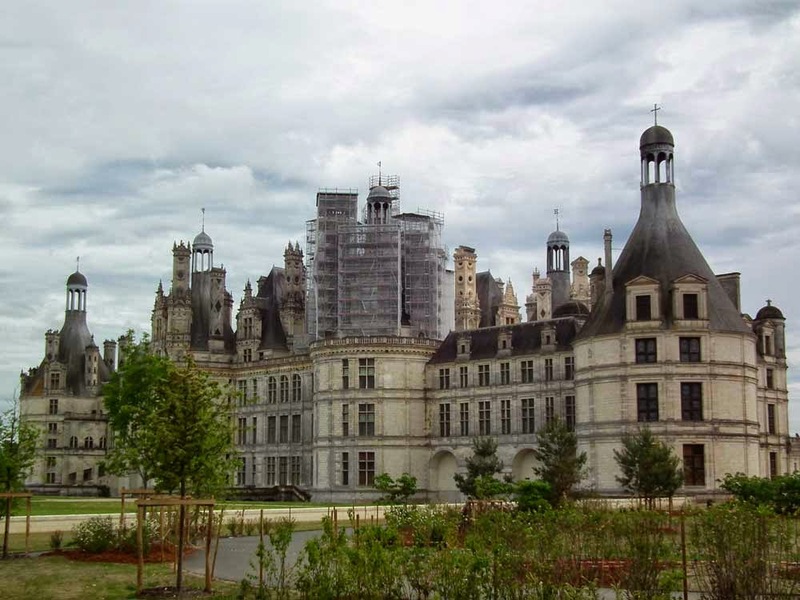 This year the Chateau of Chambord is undergoing a facelift. When we visited a few weeks ago it looked like they had completed the left hand side of the roof and there was scaffolding on the central lantern. The cleaned stone is a lovely creamy colour. French Expressions: Bobo, which is a contraction of bourgeois-bohème = trendy middle class urbanite; BCBG, which stands for bon chic, bon gout (or sometimes genre) = stylish, with good taste (and from a 'good' family/well brought up). You can also have bon chic, bon ton which means the same thing. The other day we visited Domaine de Clos Roussely, the organic vineyard run by Vincent Roussely above the small village of Angé on the Cher. 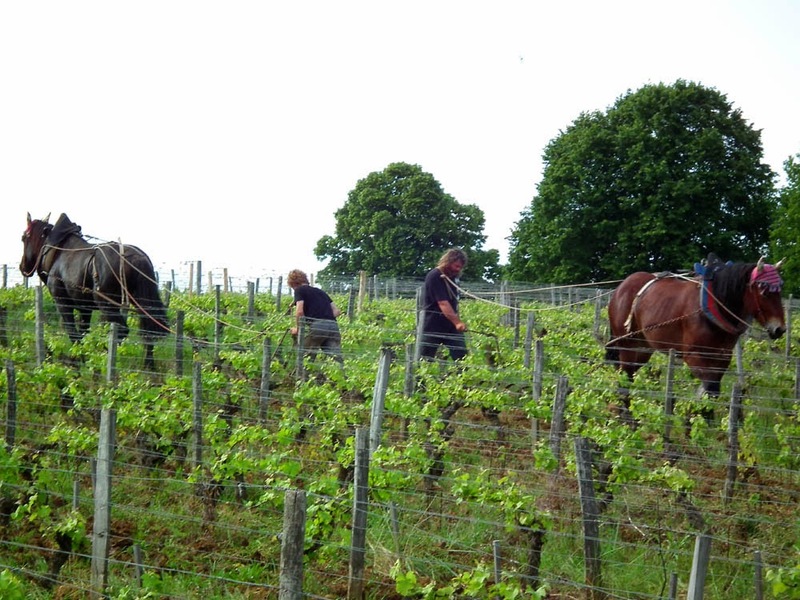 To our delight there was a pair of draft horses working amongst the vines. They were ploughing between the rows to rip up grass and wildflowers which were getting really rank. 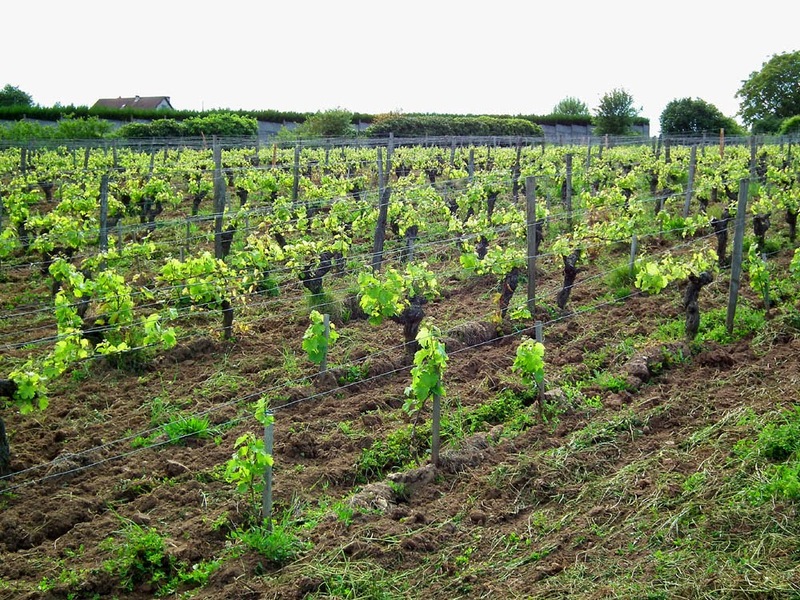 The vines are 3 weeks in advance of normal due to the unusually mild spring. 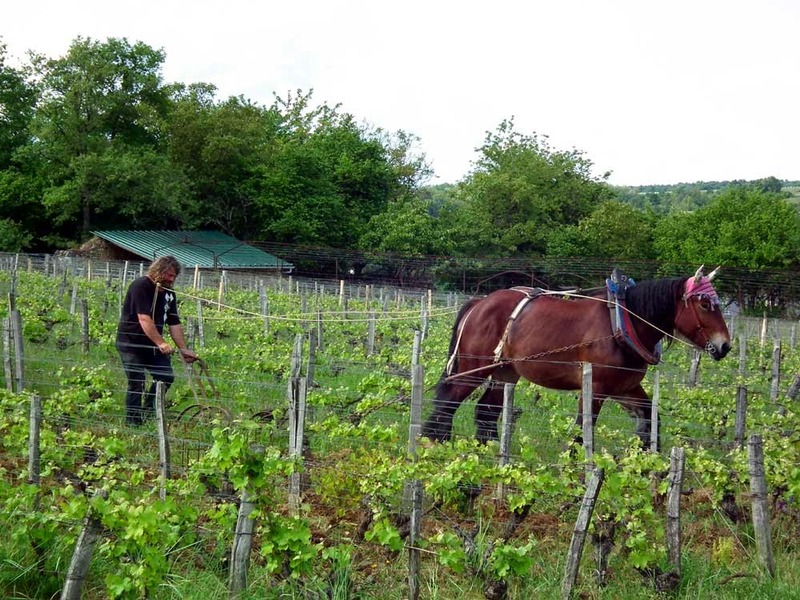 The advantage of using the horses to weed rather than a tractor is that the horses don't damage the tender growth on the vines. They also cope better when the lush weed growth tangles up the plough. Jean Pierre and Urbani, a 4 year old Belgian, come striding down the slope. Vincent never tires of reminding people to look around. He points out that the valley is rich, there are crops, woods, fields with animals, vineyards He sees it as one of his responsibilities to show visitors the biodiversity, maintaining it and valuing it, and to encourage people to take the time to admire this extraordinary natural wealth. 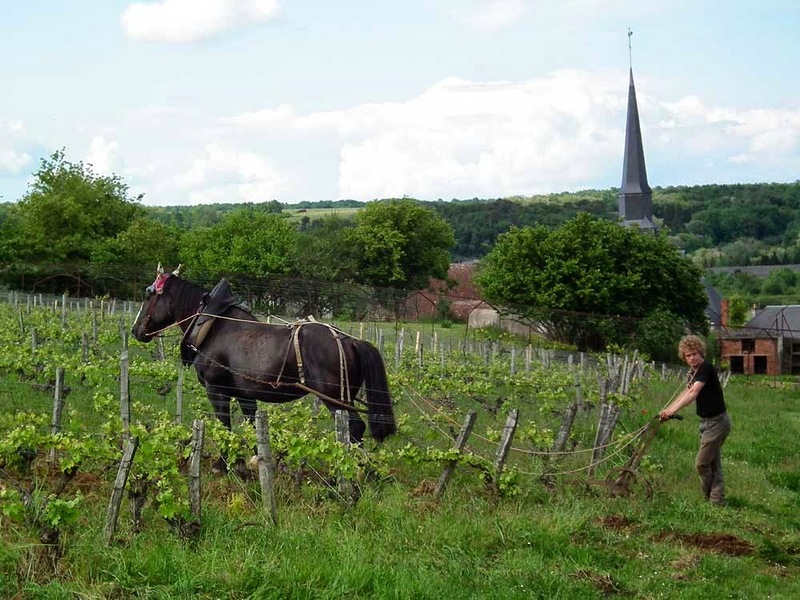 He also sees his mission as improving the reputation of Touraine wines. He reminds us that it isn't that long ago when they were just considered table wines, but now they are good quality. He's just won the new Touraine Chenonceaux classification for this parcel of sauvignon blanc, which he hopes will help when competing against major appellations with a long and well known history. 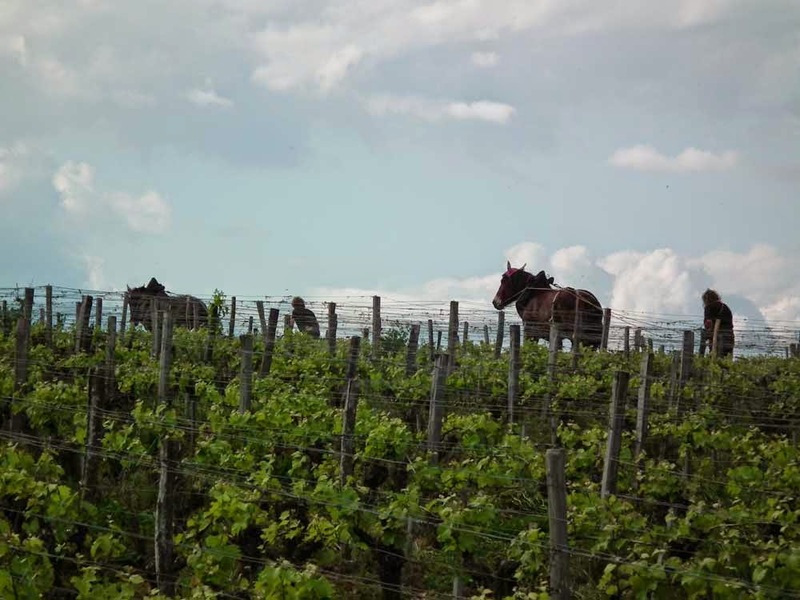 This is what the vineyard looks like once the horses have finished. The vegetation is controlled mechanically rather than sprayed with herbicide. Biodiversity benefits, and therefore the grapes benefit. 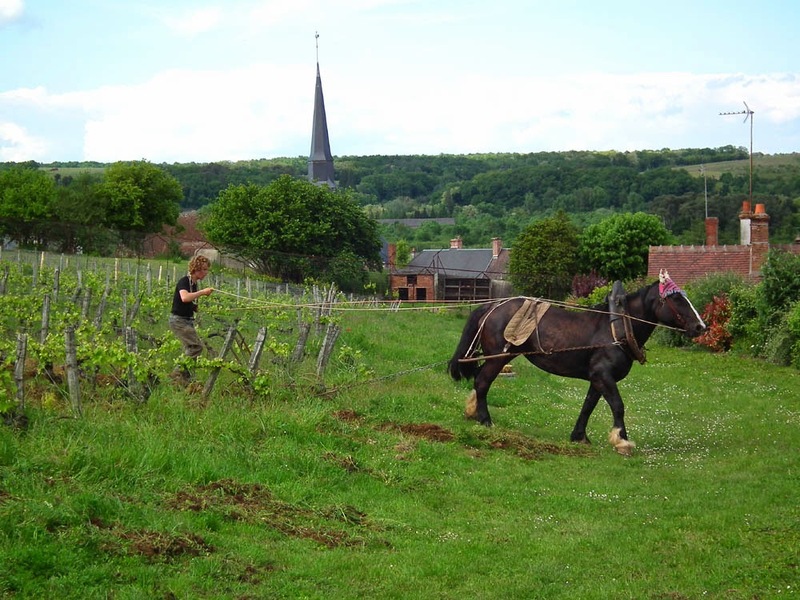 The ploughmen and their horses will visit the vineyard several times during the season. Urbani poses for a portrait. He is a thoroughly aimiable beast. 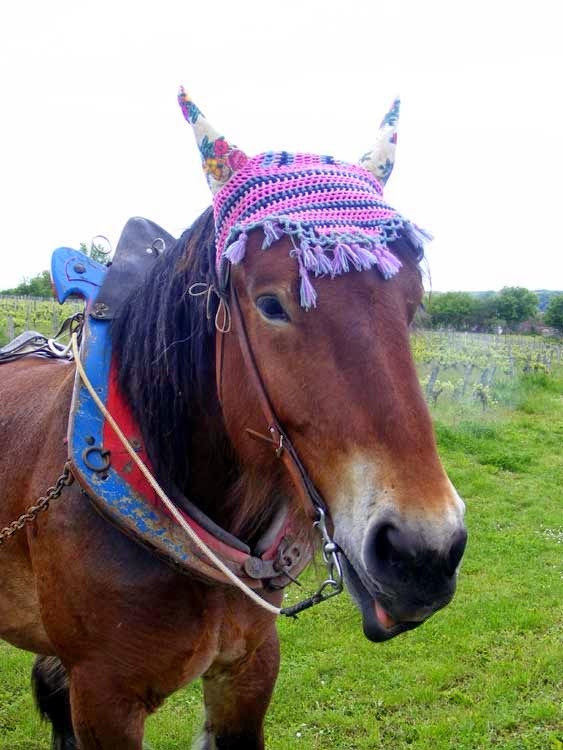 French Expression: Rouler à toute allure = flat strap/full pelt. 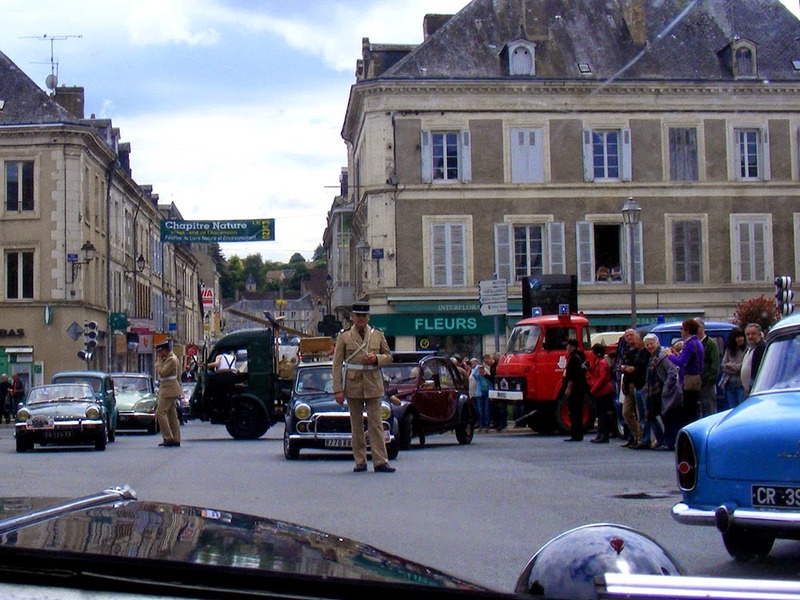 Here is a video Simon made of the Bouchon du Blanc (heritage traffic jam in Le Blanc). It was organised by the Teuf Teuf Club, and was very well attended and run. Everyone had to register prior to the event and send a cheque which covered snacks, lunch and drinks (€30 a head). 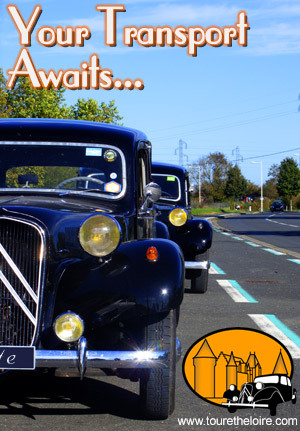 Those of us participating in the scenic drive around the Brenne prior to lunch were told to turn up at the Parc d'Expositions in Le Blanc between 8.30 and 9.30 to get checked off the list and pick up an info pack with details of the route. The soundtrack on the video is entirely 'natural'. The music you hear was coming from loudspeakers parked on the back of a vintage truck in the centre of town. The group of around 100 cars was split into two and each half set off in opposite directions. The idea was to minimise traffic disruption on narrow rural roads by having a circuit which some people did clockwise and others did anti-clockwise. We went anti, out through le Blanc, Rosnay, past the Top Secret Submarine Communications Base, through Le Blizon, Le Maupas and Le Temple, ending up at the half way point, La Gabrière, where we parked up and enjoyed rillettes, terrine and boudin noir doled out from the back of two vintage trucks and washed down with wine. At this point a couple came up to us and introduced themselves. They were Chris and her husband, who live nearby and had come out to see the cars. They read the blog and recognised us! Ensuite, reprendre les véhicules pour continuer cette ballade ! Then, back in the cars to continue the circuit! Past the étang at Le Gabriau and through the lieu-dit Le Bouchet, where the Maison du Parc is situated, into Douadic then back to Le Blanc for lunch. It was a most scenic drive and our motorcycle outriders who were there to ensure no one got lost were thoroughly competant. Lunch was a buffet of salads with charcuterie and chicken thighs, followed by cheese and green salad, then strawberry tart. Musicians were on hand to entertain with lively songs and half a dozen particularly impressive vehicles joined us in the hall. 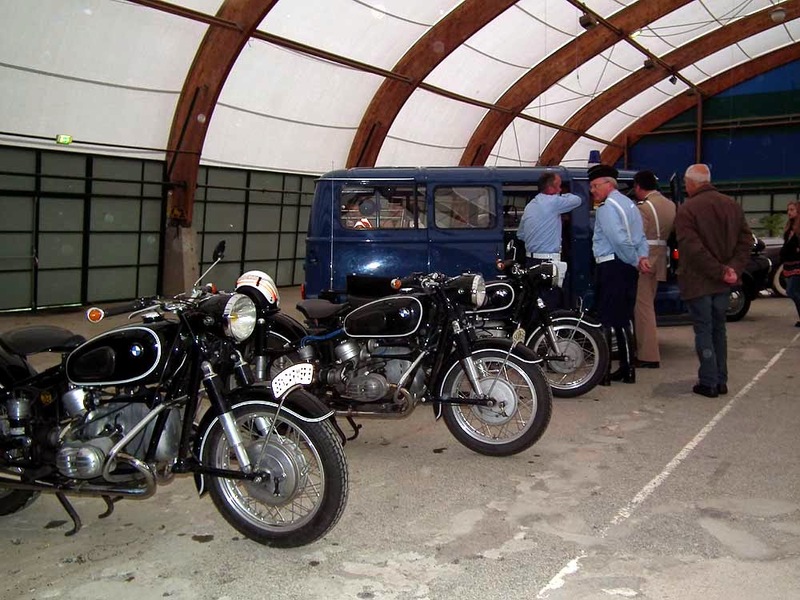 These included the vintage police and fire vehicles, still registered to the local gendarmerie, but living in the museum and in full working order. They were attended by enthusiasts dressed for their role. I didn't see a single real policeman for the whole day. 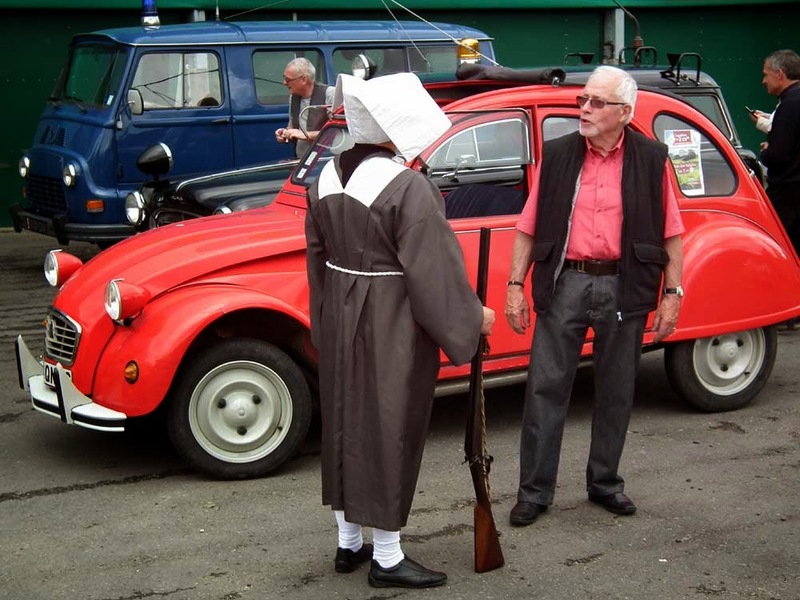 All the traffic direction was managed by re-enactors. Charmingly, when the musicians played a popular dance tune, a couple from the table behind us spontaneously got up and danced. I love the way this happens at French gatherings. Once coffee was out of the way, the real business of the day commenced. The 'policemen' nipped off on their vintage motorbikes and vans to get into position in the middle of town. Then the rest of the participants followed, with numbers swelled to about 150 cars. 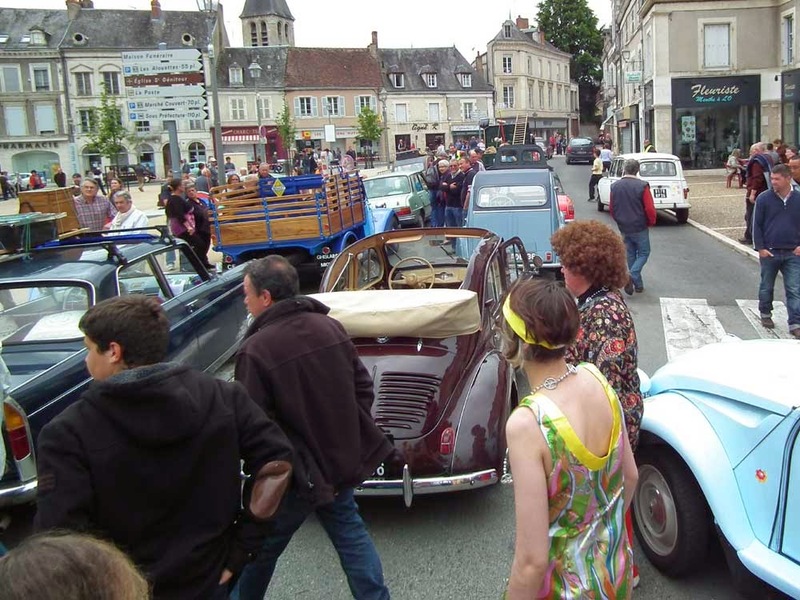 We did a sort of figure of eight until there really was a traffic jam in town, just like the days when those travelling down from Paris to the Mediterranean met those travelling down from the mountains towards the Atlantic coast on the first day of the summer holidays in 1965. Very soon old vehicles (including Claudette) were over heating and pulled over on the side of the road with the bonnet up. Everything came to a halt, people abandoned their vehicles and went and had a beer. A huge crowd had gathered by this time, so the centre of Le Blanc was heaving. None of the photos give you a sense of how many people were there, but seriously, it was jam packed! The photos also don't give a good idea of how people dressed to match the era of their car. After an hour or so of extremely good natured traffic jamming, vehicles were asked to park normally, and more beer was consumed. Then around 5pm, it was broken up, with some people going home, others heading back to the Parc d'Exposition for a pot d'amitié (friendly drink). We thoroughly enjoyed ourselves and think the concept is brilliant. Now is the time you might see larval ground beetles in the garden. The one above was photographed in our orchard in early June last year and the adult only a couple of metres away from the same spot in September. 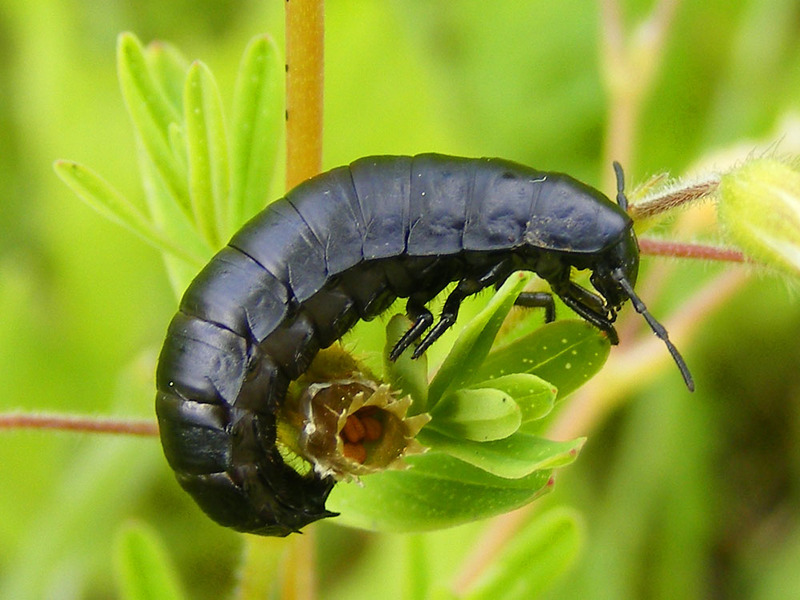 Large larvae like this are the gardener's friend, being voracious consumers of slugs and snails, just like the adults. 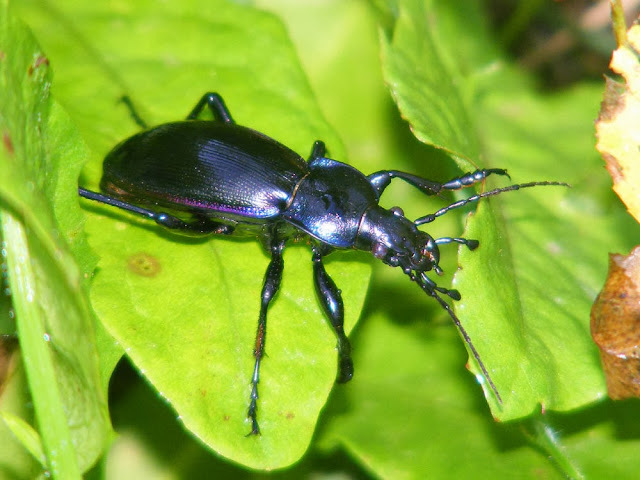 I think the species is Violet Ground Beetle Carabus violaceus. Botany Outing: There is an orchid and general botany outing on Sunday 1 June to les Coteaux de Sainte Maure. Meet at 14.30 in the carpark at des Passerelles in Sainte Maure (formerly the parking for the 4 routes). Organised by the Association de Botanique et de Mycologie de Sainte Maure de Touraine. French Expression: Si cela vous convient = if that suits you (as in 'I'd like to come over on Thursday, if that suits you'). 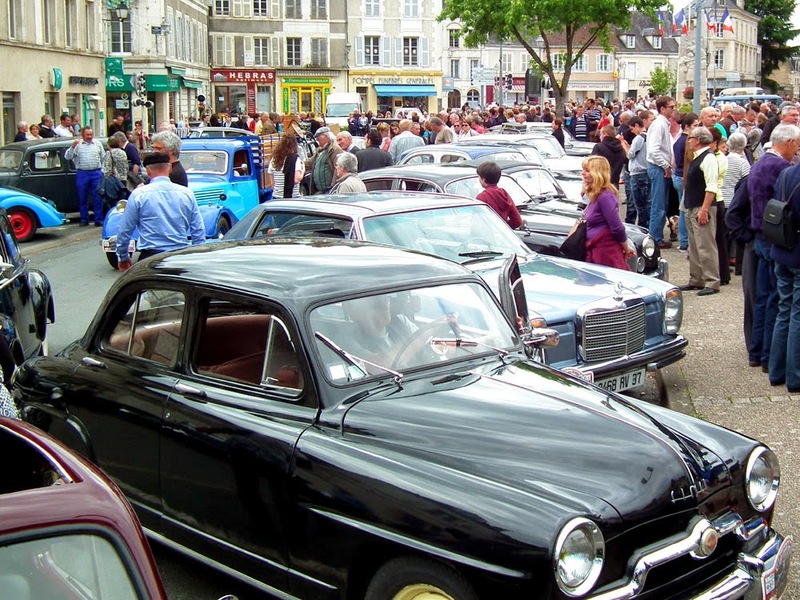 Heritage Traffic Jam: The Bouchon au Blanc on Sunday was terrific fun -- more than 150 pre-1970s cars making mayhem in the centre of Le Blanc, just like the good old days when everyone set out on their holidays on the same day and those going south met those going east-west at Le Blanc. Simon did a quick post about it yesterday and more will come when Simon has prepped the movie and the photos and I have time to write it. We popped in to the polling booth on our way to Le Blanc and did our civic duty at the Europeans. Latest Buzz: Some of you may have noticed reports of a Harvard study a couple of weeks ago claiming to have definitive proof that neonicotinoids are the root of all evil when it comes to bee health. Once again we have a study which has been uncritically picked up by mainstream media because they can catastrophise about the future of bees and humanity in a way that their readership has come to expect. If you are interested in such matters, please read this critique of the study, which points out some fairly obvious flaws in the science. I do not wish to sound like an apologist for neonics, but seriously, although they are not helping, they are not the main problem, and no credible bee researcher would link them to colony collapse disorder. Honey bees are mainly suffering because of varroa mite, and bees in general are suffering because of habitat loss, which means that they starve. Canola flowers are all very well, but their season is short and with intensive farming there are no crop margins to take over feeding the bees. Basically, if you are not concentrating on habitat loss you are just fiddling at the edges of the problem for wild bees and honey bees are a domesticated animal and there is a husbandry issue with them. Yesterday was the bouchon at le Blanc. This is a heritage traffic jam, celebrating (possibly the wrong word) the huge traffic snarls that bought much of France to a halt before the introduction of the Autoroutes. Here are some pictures - there will be video and other pics to follow. We took Claudette, as Célestine is still at the dentist's. After a while everyone just parked and had beer. 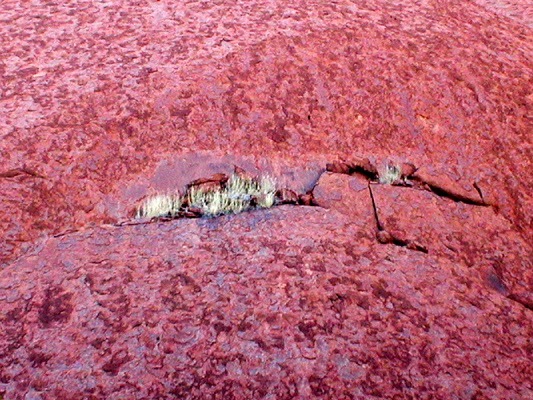 Uluru is the most remarkable rich red ochre colour. French Expressions: Un coup pour rien = a waste of time. Ça vaut le coup = it's worth it. A la cuisine hier: Onglet (skirt steak) marinated in honey, soy, garlic, ginger and a soupçon of chilli and grilled, served with buttered steamed new potatoes and green peas. Nouvelles mondaine: We were saddened (ahem...) to see that our favourite bimbo télévisuelle, as she was described in the Nouvelle République, apparently without rancour, has eschewed the charms of the Loire chateaux and has married in Kenya (sorry -- some sort of Freudian slip there -- they got married in Florence). 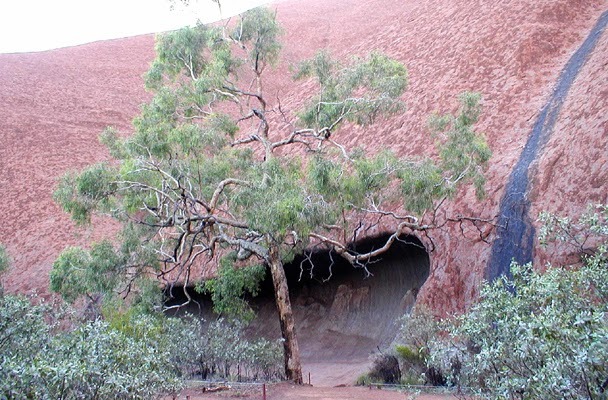 A cave at the base of Uluru. Car News: We are a bit stressed, but it could be worse. 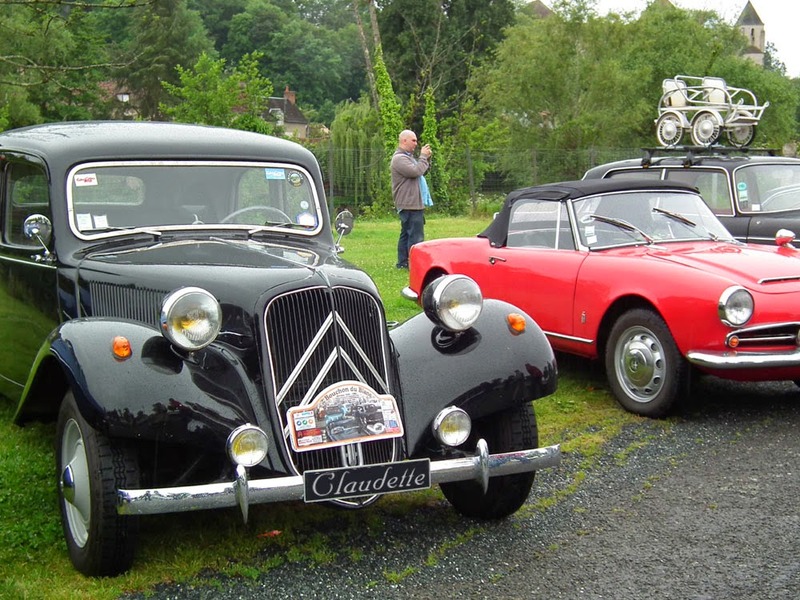 Until yesterday both Célestine and Claudette were at the mechanics and had been for a week. Célestine is still with Jean Louis and we don't know when we will get her back. We don't have a definite diagnosis yet, but it seems likely she has broken a tooth on a differential cog. All these anti-clockwise roundabouts mean she gets to turn left more often than right and it puts a strain on the diff. Fortunately Claudette came home yesterday afternoon, with a new brake master cylinder, her exhaust fixed, her timing regulated and a bead of silicon round her windscreen. Phew! Luckily we didn't have to cancel any clients, but it might mean Claudette gets to work 10 days straight on her own, in the wet. We are taking her on a heritage traffic jam tomorrow, so we may get to see if the temporary solution to the leaking windscreen works. A la cuisine hier: Magret de canard (fat duck breast) from a local organic producer, cooked French style so it was pink inside. Served with a rather elaborate potato salad which included chopped tomato, olives, broadbeans, onion, parsley and a mustard vinaigrette on shredded lettuce. Dessert was the last of a large clafoutis I made several days ago. We still have several kilos of cherries in the freezer and cherry season will be upon us in a matter of weeks, so I figured I needed to use a few up. Little Bustard: I am thrilled to report that I saw two male Little Bustards Tetrax tetrax (Fr. l'Outarde canepetrière ='farting duck bustard') the other day. We were driving along between Sublaine and Chedigny and two birds flew across the road in front of us and landed in a ploughed field as we drove on by. At the time I said to Simon that they looked just like bustards, but we had clients with us and didn't stop. I've seen the Australian species several times, but knew that the French species was rare, so I didn't really believe that I'd seen them here. However, yesterday, quite by chance, Pauline happened to mention that there was an outing today to see the bustards near Sublaine. 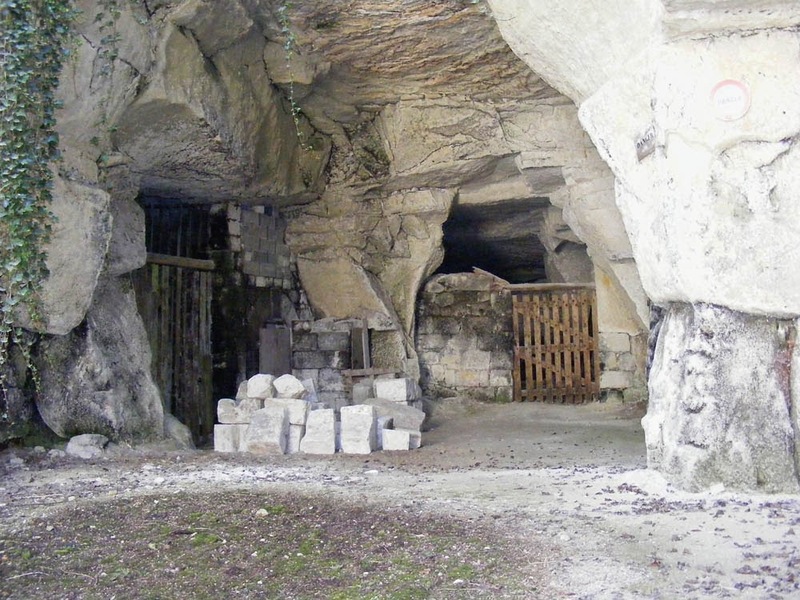 Apparently there is a small population of about 66 birds in an area known as the Champeigne Tourangelle, a limestone plateau between Bléré and Loches. I had no idea! The species is Red Listed for France and the population has declined by at least 80% in the last two decades due to habitat loss caused by modern intensive arable farming methods. A Natura 2000 site was established in the Champeigne Tourangelle in 2006 and now half the farmers in the zone are contracted to maintain uncultivated areas rich in leguminous plants such as lucerne and sainfoin suitable for the bustards. Between them they manage 1088 hectares for the bustards and are paid a total of €330 000 to do so. This habitat conservation project has had benefits for 8 other rare species of lowland grassland birds too, such as Hen and Montagu's Harriers. Preuilly News: Today one of our pharmacies closes for good. Mme Billaud the pharmacist, an attractive and lively woman of Chinese and French ancestry, is retiring and the business has been sold to the other pharmacy in town. The staff are migrating to the other business too. Apparently the French government has increased the population each pharmacy is required to service (no matter what area they are spread over) and so several thousand pharmacies across France are closing. I hope to see Mme Billaud in the future though, at botany outings, and at her request have given her a leaflet for the Association de Botanique et de Mycologie de Sainte Maure de Touraine. An article in the Nouvelle République raises the alarm about the lack of maîtres-nageurs (swimming instructors) who are willing to work seasonally at country swimming pools and swimming lakes which are only open during the summer school holidays. Local authorities here are obliged to employ a maître-nageur and offer swimming lessons over the holidays, but they can't pay as much as the local authorities at the seaside. The life-saving association Aqua Life Saving (who provide volunteer life-savers at pools and swimming lakes) estimates that France is short by about 1000 maîtres-nageurs. I hope we manage to get someone! Laurent come back we need you!! This scene of aboreal devastation is on the riverbank at Montrésor. 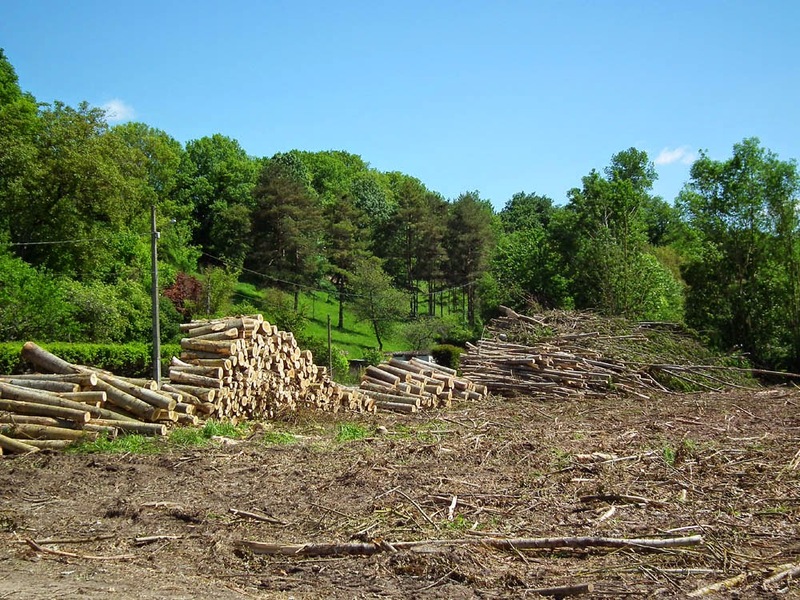 The poplar plantation on the edge of the village has been felled. That's a lot of cheese boxes. Naturally we have no decent photos to provide a 'before' view... This one (below), showing the plantation on the left in November 2010, when the trees are leafless, is the best I can do. It will be interesting to see how the area develops and how they intend to manage it from now on. A la cuisine hier: Spicy crumbed chicken breast, made with adobo spice mix, parmesan and breadcrumbs. Simon thought the spice was a bit too zingy. Served with grilled tomatoes and steamed broccoli. 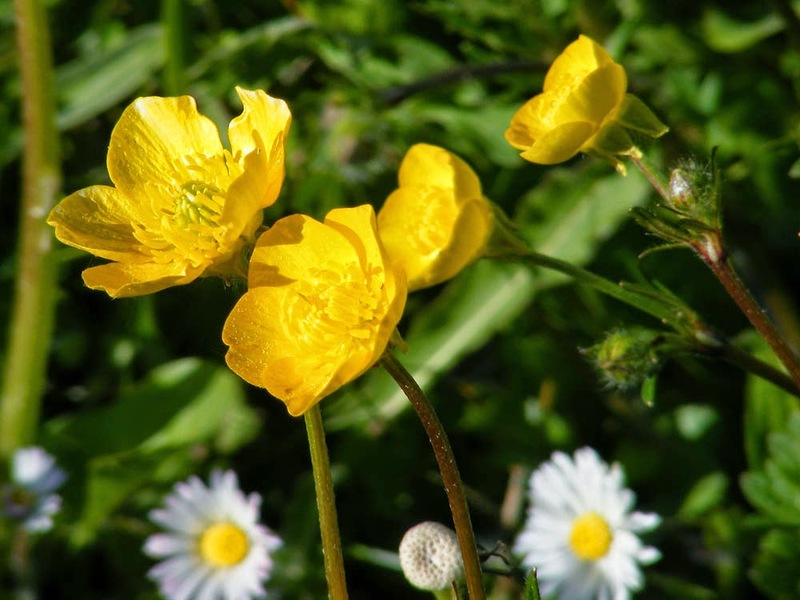 Did you know that you can calculate the age of your meadow by counting number of buttercup flowers with more than 5 petals? 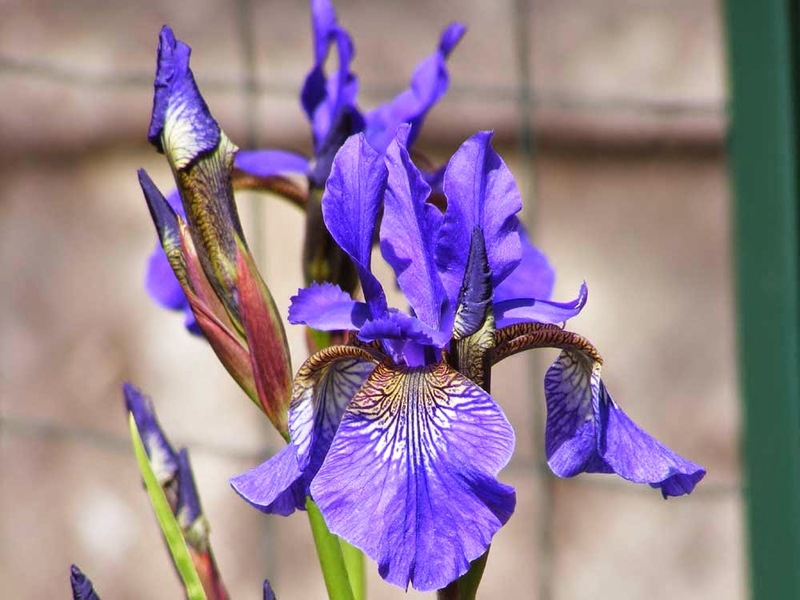 Select 100 flowers at random and count the ones that have mutated to have 6 or more petals. I tried it in our orchard and got...none... This is not to say the technique doesn't work, just that our orchard is not untouched meadow land. See an article about the research that established the method here. Botany Outing: There is an outing to see the orchids of the Eperon Barré de Murat on Sunday 25 May. Meet at 14.30 in front of the church in Ferrière Larçon. The outing is organised by the Association de Botanique et de Mycologie de Sainte Maure de Touraine. Yesterday's Quiz: PG is the winner because she got in first, but Carolyn and RiF get points too. 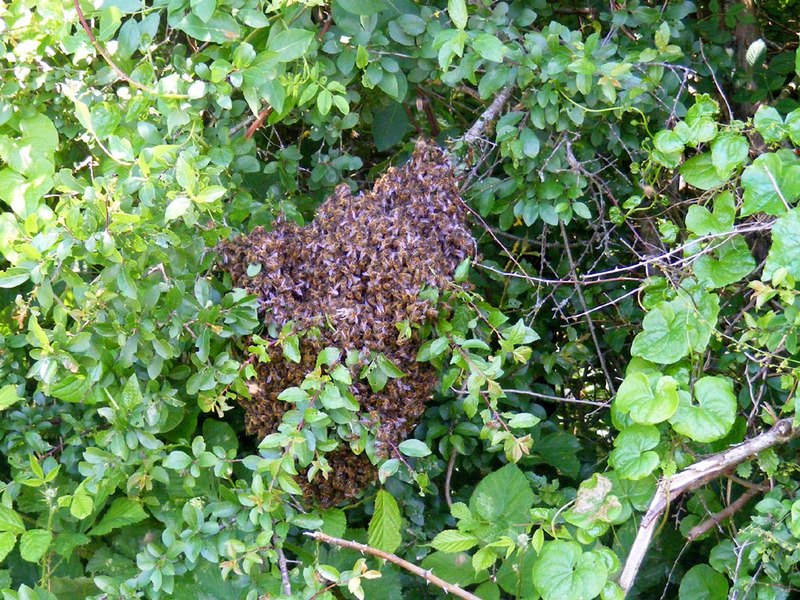 Late spring is the time you can encounter swarms of Honey Bees Apis mellifera in the forest here. They can be rather alarming if you hear them before you see them, especially if you are just mooching about minding your own business. A steadily increasing hum coming from above and behind is never reassuring. A few days after I photographed this swarm in early June last year, on the edge of the forest between Boussay and Yzeures, our neighbour called me over to look at a small swarm in her apricot tree. However, you don't really have much to worry about. Swarming bees are not generally considered dangerous, as they are not protecting their precious honeycomb store of bee larval food. These bees will find a hollow tree to set up a new home or sometimes make a free hanging wax comb in the forest. Honey Bees are not really native to Europe, but like the Carp in the rivers, they have been here so long (many centuries) they are naturalised and do not cause any particular problems in the wild here (unlike in America and Australia, where they out compete the native bees). The French for a swarm of bees is un essaim d'abeilles. Points: 2 points will be awarded to anyone who can tell me where the title of this blog post comes from. Steve the Siberian Iris has decided to sulk this year because I haven't repotted him, and he is not going to flower. Meanwhile, the Pseuds out the back are partying like mad and putting on a great show. 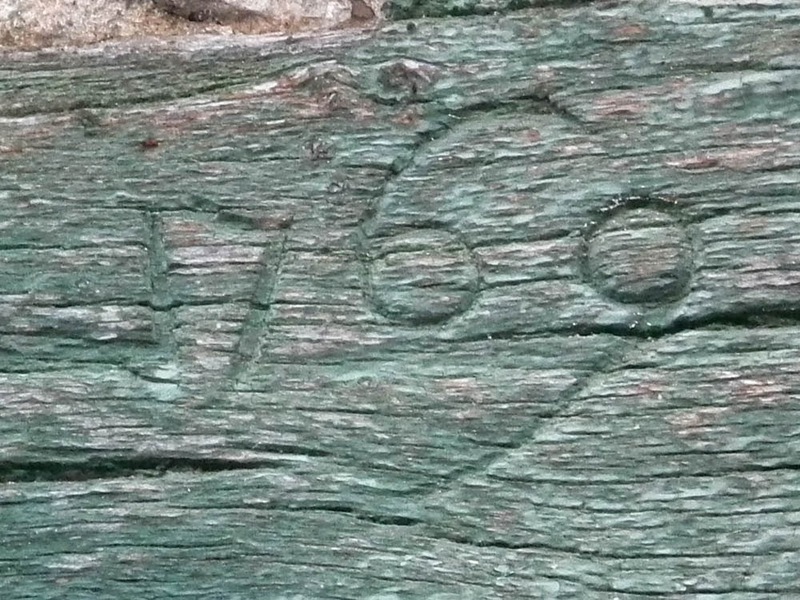 This date is carved into the lintel of a garage in Chedigny. I suspect it's genuine. Louis Antoine de Bougainville returned to France this year, having got as far as the Great Barrier Reef, not realising what lay beyond the dangerous reefs and shoals. He was the first Frenchman to lead a circumnavigation of the world, and his expedition was the first to take a team of naturalists. Remarkably, he lost only 7 crew on the 3 year journey. James Cook arrives in Tahiti for the first time and crosses the Pacific to New Zealand but does not make it to Australia until the next year. James Watt establishes himself in the anglophone public's mind as the inventor of the steam engine, effectively sidelining Denis Papin's legacy from a generation earlier in France. Spain establishes the colony of California. Daniel Boone sets out to explore Kentucky. Richard Arkwright invents the spinning frame and kick starts the Industrial Revolution. Arthur Wellesley and Napoleon Bonaparte are born. 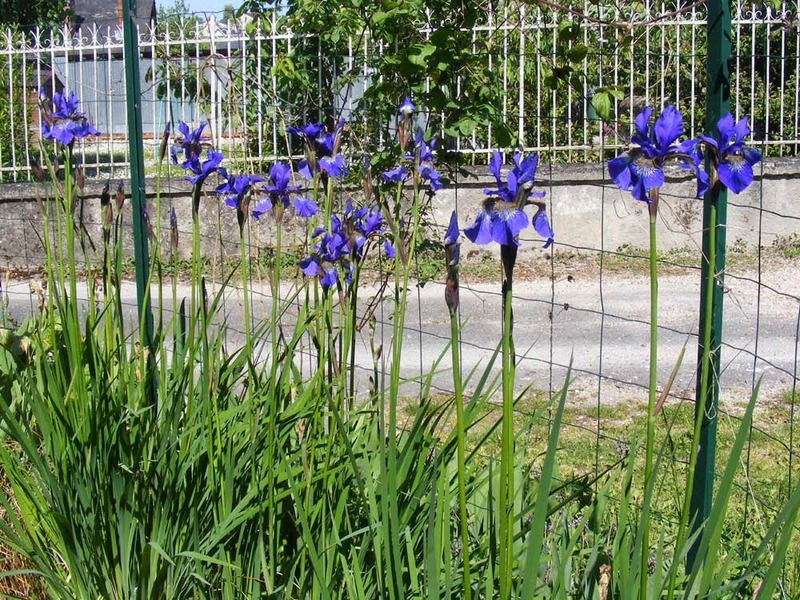 Save money, time and biodiversity: There is a nice article in the Nouvelle République encouraging local authorities and landowners to stop mowing, hedgetrimming and strimming in the spring. The LPO point out that it costs money, time and impacts very negatively on nesting birds and insect populations. By mowing you remove nesting birds food source (insects in the grass) and prevent plants from setting seed; and by hedge trimming you destroy nests or cause birds to abandon them. They understand that maintenance is necessary, but point out that mowing has become a reflex action, and it is not a necessity. There are nice ways you can maintain your property or roadside without endangering the wildlife or property values. For instance, mow paths through grassy areas, not the entire area. Don't trim hedges until the autumn or winter. If you mow over your orchids in the grass, you don't get to enjoy them in flower. The places that are mowed are the last areas where pesticides are not used, so they are more and more important as refuges for both plants and animals. the height of the cut is important. Don't cut lower than 7cm. Mowing lower results in killing 70% of the insect life. don't mow at the end of spring, but allow plants to set seed. begin mowing in the centre of an area, to allow creatures to escape to the sides. leave the clippings in situ (at least temporarily) to allow creatures to stagger out and find new areas nearby that will support them. in a big area, just mow paths. They make a great game for the kids. Don't mow the rest more than once or twice a year. You find lots of unexpected species appearing in the untouched zones. Botany Outing: Yesterday I spent the afternoon on the Pelouse des Grandes Fontaines at Bléré with the botany club. Gazillions of orchids, a new butterfly species for me and an impressive new broomrape. I'll write a blog post at some stage to tell all. 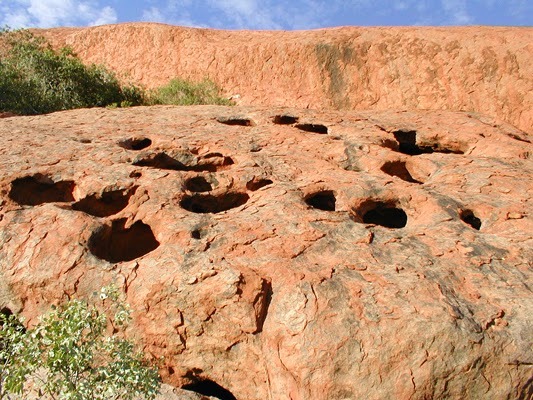 The weather of centuries has created all sorts of pits and patterns on Uluru. 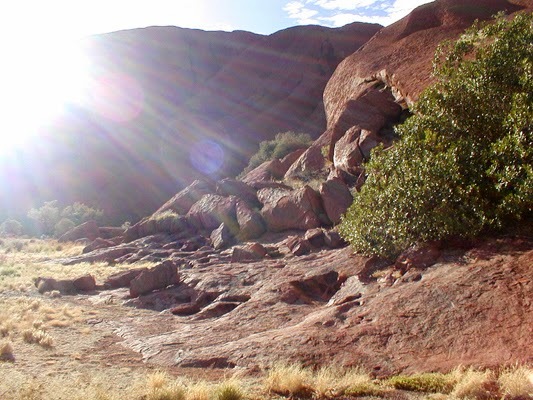 Sun streams down on the base of Uluru. 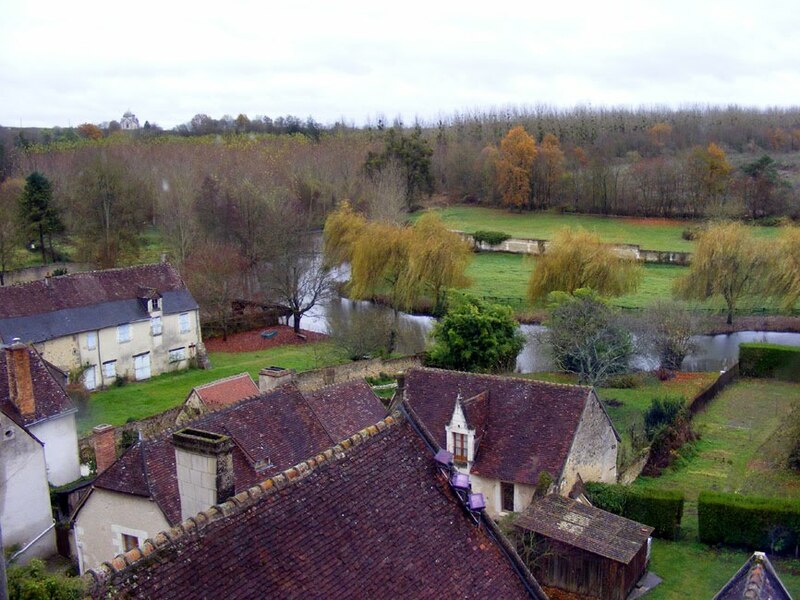 Imagine you are cycling along the Loire between Turquant and Saumur and all of a sudden the signs direct you off the levee bank and up onto the river cliffs. Not just along the old road in front of the chateau and the other fine houses that back onto the cliff either. 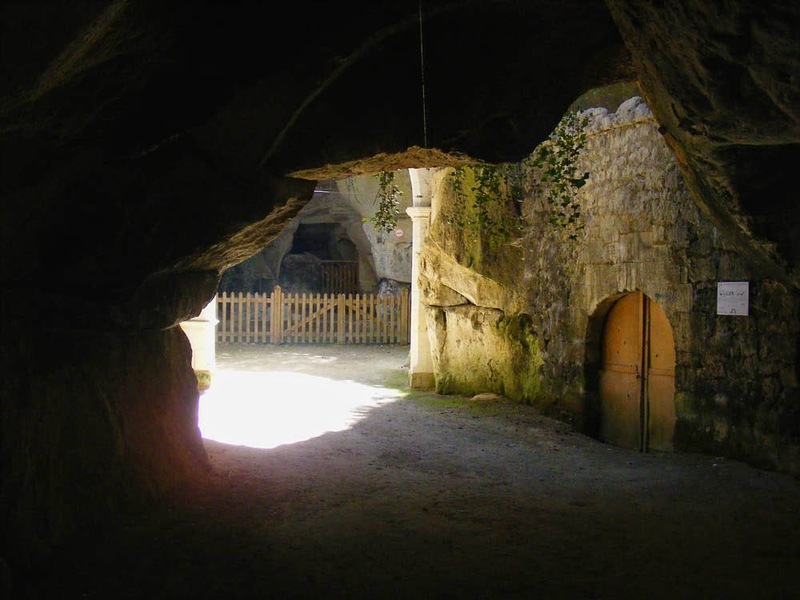 You are directed underground, into the atmospheric world of the troglodyte caves. 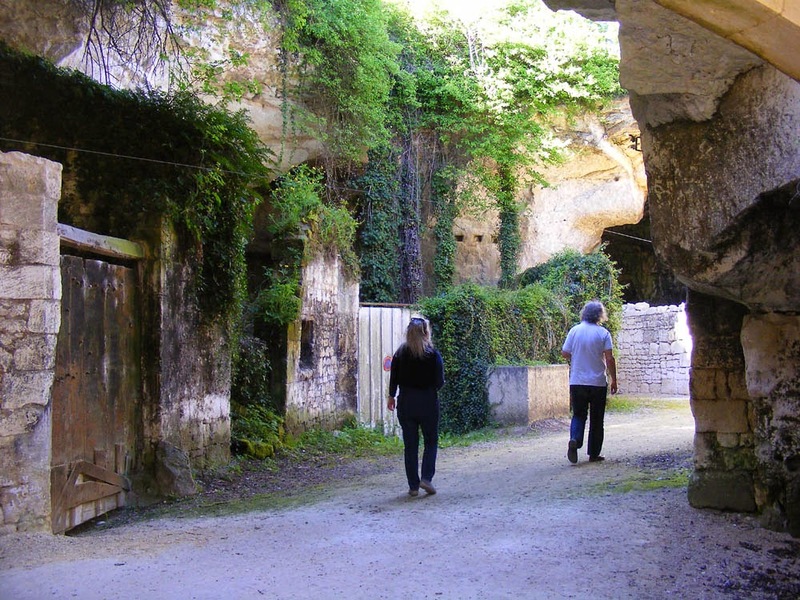 Our friends Rosemary and Jean Michel had just this experience and wrote about it on Aussie in France. I was so intrigued by the troglodyte village they encountered that I was determined to go there myself. A visit from our good friend Liselle provided the perfect opportunity, as we could show her something new and exciting that we hadn't seen either. The troglo system is vast and stretches from one end of the village to the other. Periodically one pops out into the sunshine where the roof of a cave has collapsed and created a sun drenched hole in the ground. In these holes you will find private houses tucked away, or a stylish slate picnic table and public toilets for tired and hungry cyclists. One section of the complex was a medieval parade of shops, others were workshops, storage units or houses. 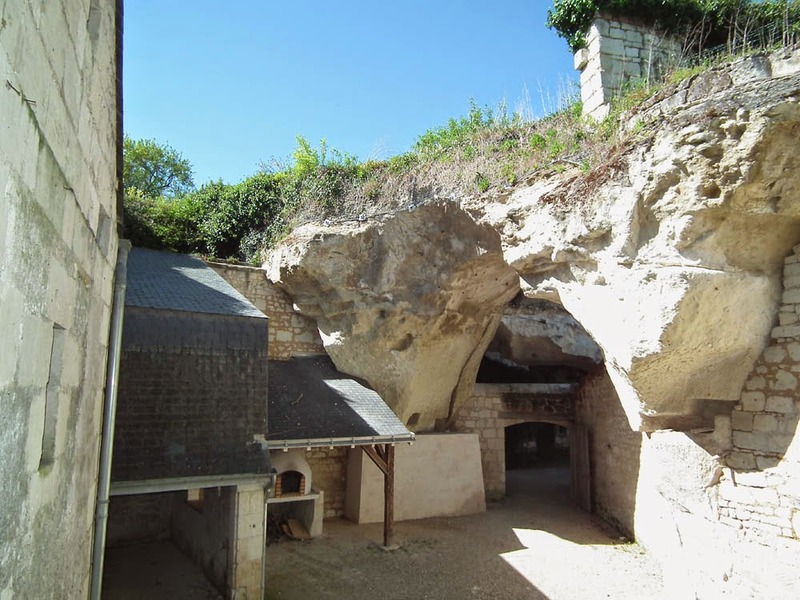 Throughout there are excellent illustrated information boards (in French) explaining the quarrying process, the geology of the area and the various uses the caves have been put to subsequently. 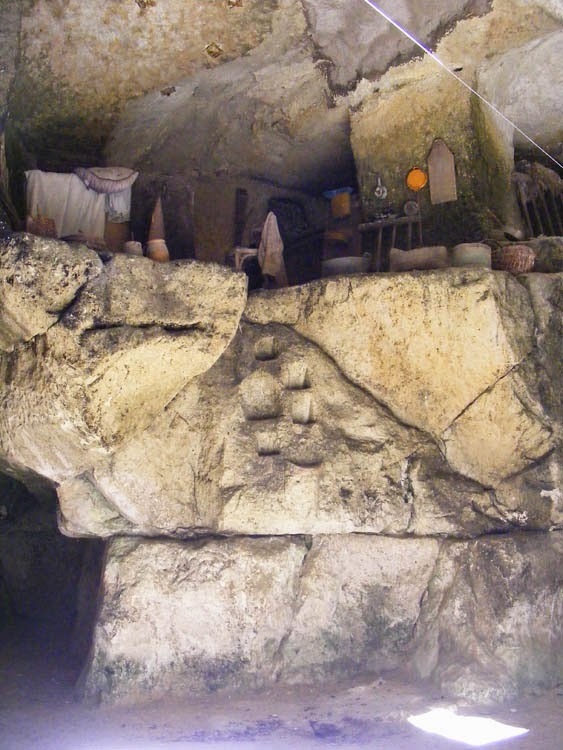 For example, some of the caves were used to store silk worm coccoons. It wasn't until the 12th century that the secret of how silk was made arrived in southern Europe. In the 15th and 16th centuries, numerous mulberry trees were planted in the south of France and the Loire Valley and buildings or caves given over to the raising of silk worms by local women. It provided a not inconsiderable boost to household incomes, even though the silk from this area was not particularly prized -- the locals never quite got the hang of spinning it finely. Later, in the second half of the 19th century, a disease attacked the caterpillars and the industry disappeared. 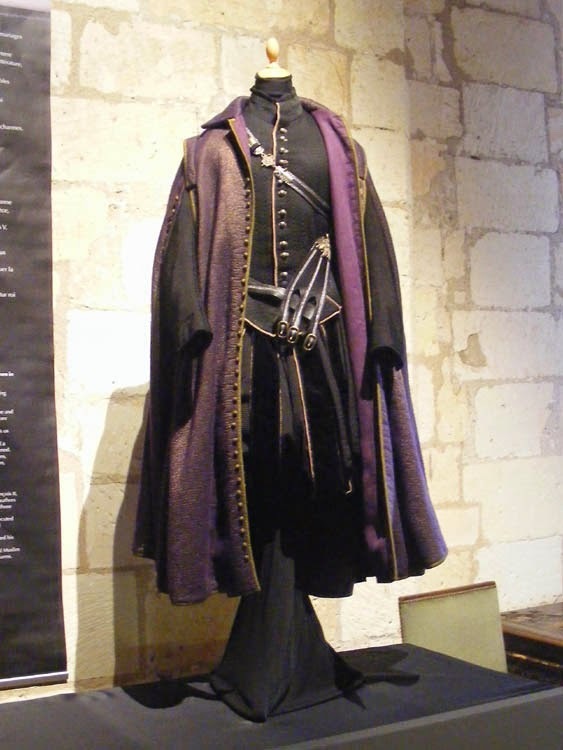 The Logis Royal in Loches is hosting an exhibition of medieval and renaissance costume from French film and television programmes this year. Here are some examples. Below, a costume for an actor playing Henri IV in a 2010 television documentary that did a facial reconstruction of the King when a mummified head which many believe to be his was discovered in an attic. 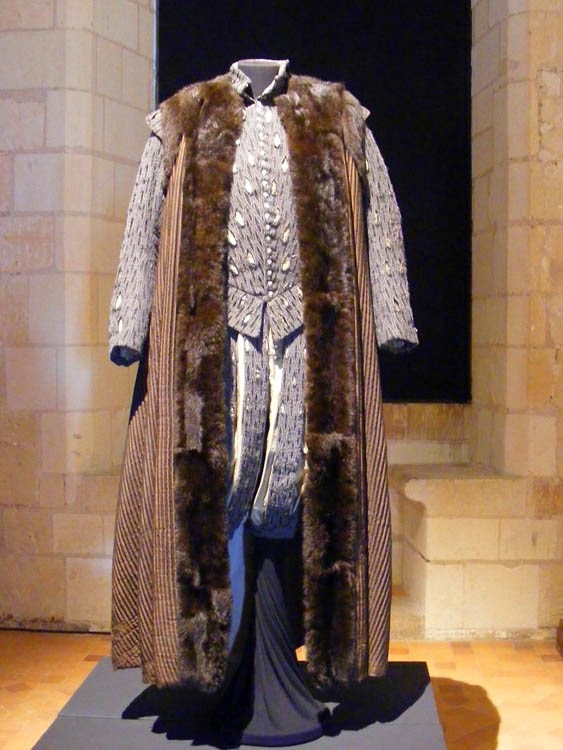 Grey cloth with false puffs and slashes, in the style of the end of the 16th century. 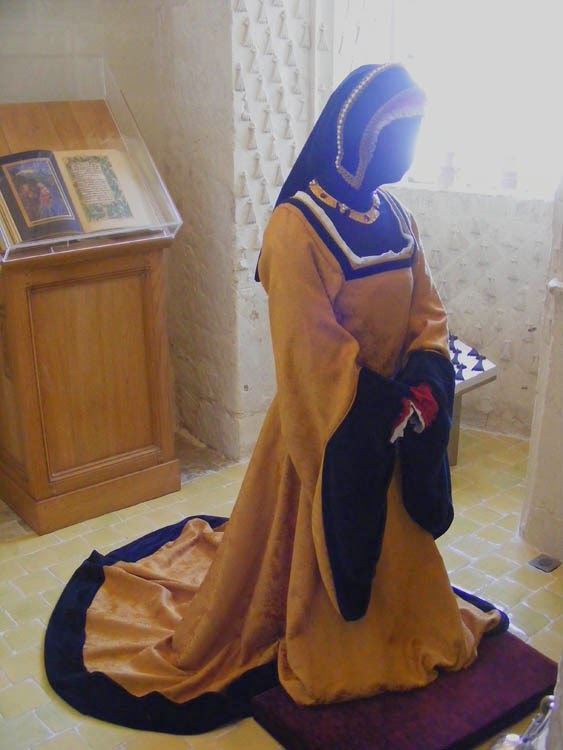 A costume for Anne of Brittany, an evocative addition to her oratory in the royal apartments. The Chateau of Candé really strives to accommodate the widest possible biodiversity on its estate. A recent success story has been the arrival of a breeding pair of Eurasian Dragons in the park. Let's hope they manage to raise the young to adulthood and in time we might have a permanent population of these elusive and iconic beasts. Simon demonstrating the best way to approach an adult female dragon with nearby young. The dragon's nest. Several young can clearly be heard, although they are very difficult to get a glimpse of. 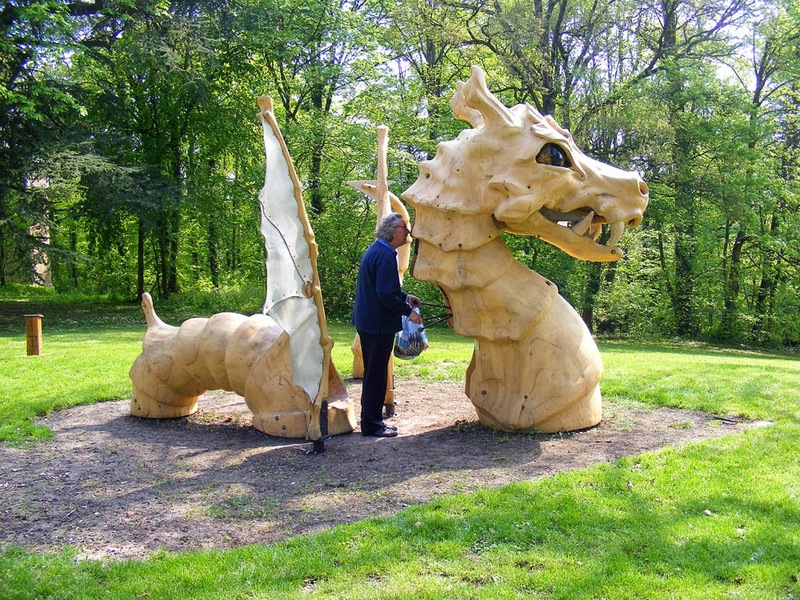 A number of these innovative hanging hides have been installed around the park in the vicinity of the dragon's nest. They hold one or two people in considerable comfort, and of course, total safety. Apparently dragons can't see this particular shade of red. Botany Outing: There will be a botany walk on Sunday 18 May to learn about the orchids of the Pelouses des Grandes Fontaines at Bléré. Meet at 14.30 in the stadium carpark at Athée sur Cher. 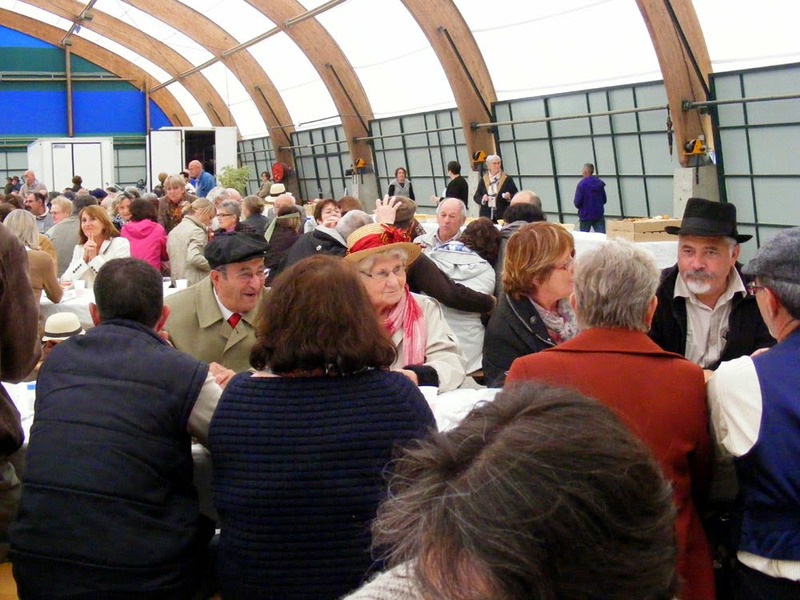 Organised by the Association de Botanique et de Mycologie de Sainte Maure de Touraine. An echauguette is a 14th - 16th century surveillance tower, set high up on a corner of a building and projecting in such a way as to provide the widest possible angle of view. 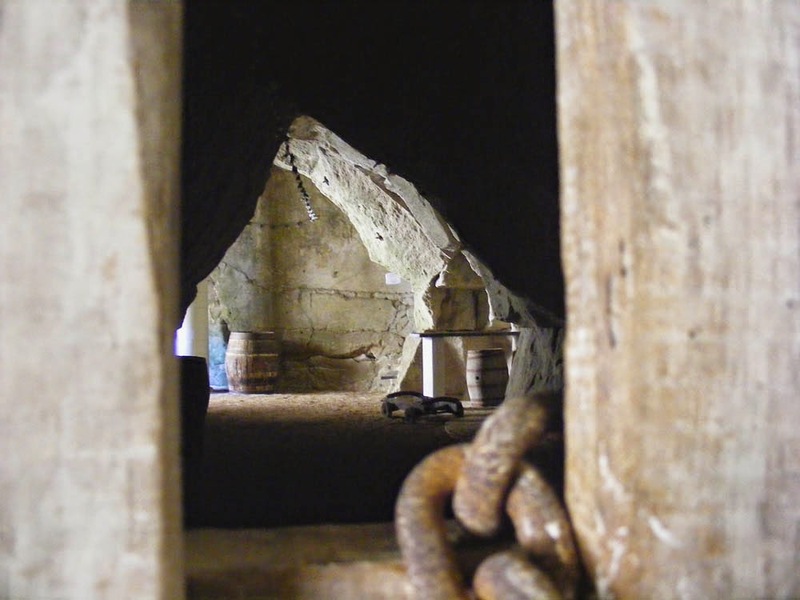 They are sometimes equipped with murder holes or arrowslits to allow active defense, but their primary function is to shelter and facilitate the observations of one or more sentries keeping watch for a house, town gate or castle. A la cuisine hier: Ham and egg cups -- another variation on the oeufs coccottes theme. 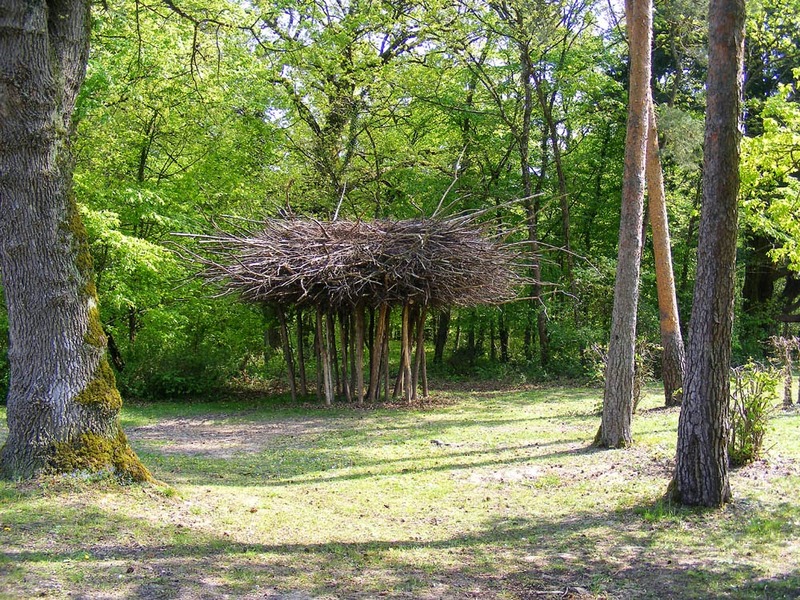 Loire Valley Nature: A new Habitat entry has been added for Prairie (meadow). A photo has been added to the entry for Tongue Orchid Serapias lingua. 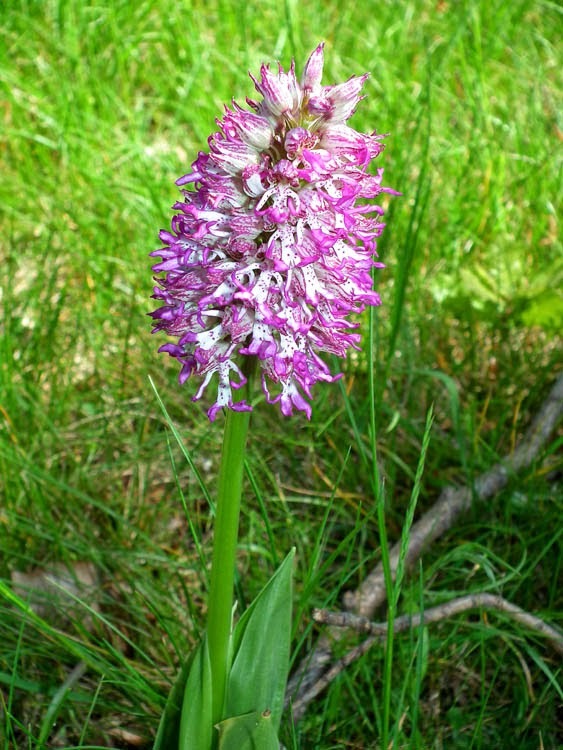 A photo has been added to the entry for Loose-flowered Orchid Anacamptis laxiflora. The roof on the Chateau of Candé has been shrinkwrapped! 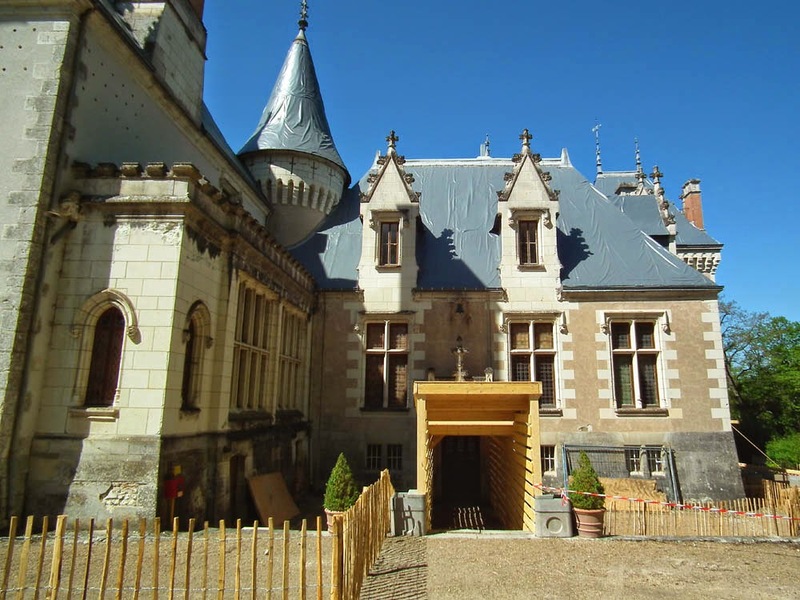 They are once again undergoing major building works, having received a substantial grant from the Conseil Général (along with the other sites run by the departmental council, such as the Prieuré de Saint Cosme). Presumably this and the various temporary structures to protect people entering and leaving the building is a prelude to getting a new roof. 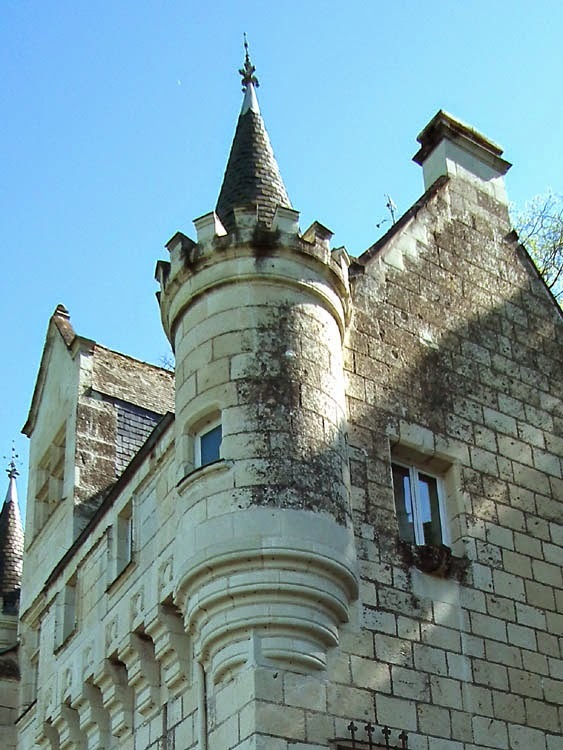 We will watch developments with interest as this is one of our favourite chateaux. We were most impressed with how discreetly the building works has been blended in so the visual disruption and potential disappointment for visitors is minimised. A la cuisine hier: Pollachius virens (aka Atlantic Pollock, Coley or lieu noir), brined and poached in an oriental style broth made from sherry, rice vinegar, canola oil, soy sauce, ginger and garlic (see recipe here). A great way to treat a cheap, fragile and unexciting fish like coley. Supporting Our Local Orphans: Yesterday we went to the annual plant fair held at the Chateau of Verneuil sur Indre. 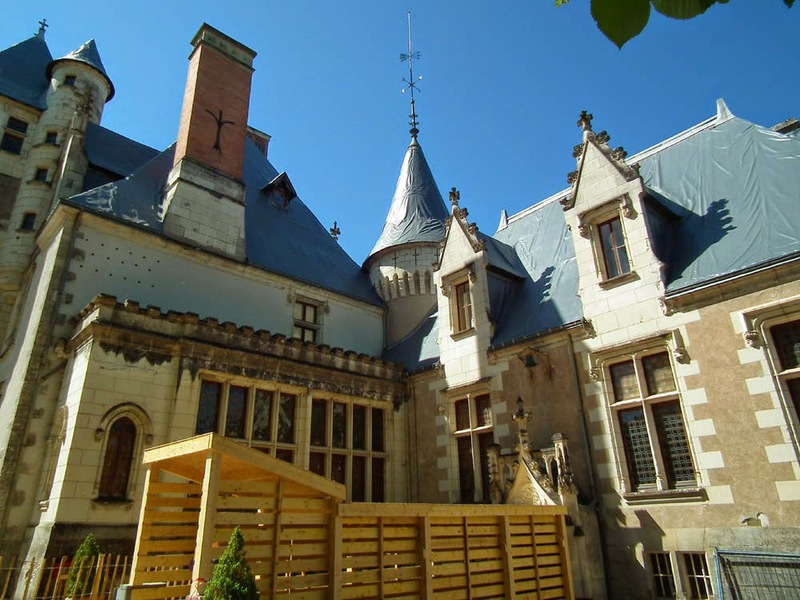 The chateau is home to a horticultural college that takes disadvantaged kids and trains them to be horticulturalists, landscapers and gardeners. Most of the kids are sans papiers ('without papers'), meaning they are refugees. Most have arrived in France as minors with few or none of their family with them. They raise many of the seedlings for sale at the fair, but other nurseries are invited to have stalls as well. We bought red and white bedding plants for our window boxes and I won an ornamental sage plant in the tombola. We timed our arrival and departure perfectly, being in the greenhouse for the duration of an almighty downpour. 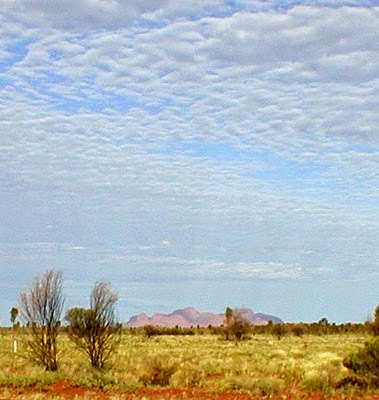 Dreaming in the distance, the rocks of Kata Tjuta, in the same National Park in the Australian Northern Territory as Uluru. 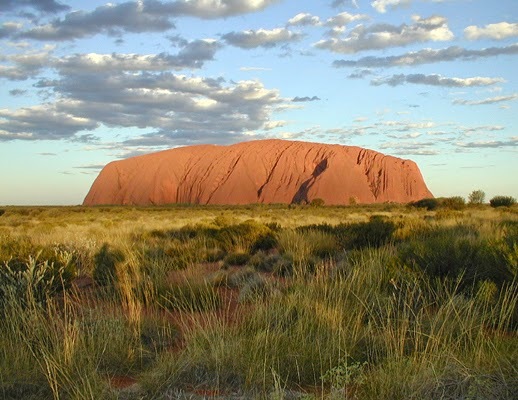 They are nearly 200m higher than The Rock. Loire Valley Nature: A new entry has been added for Pasqueflower Pulsatilla vulgaris. A new entry has been added for Dog Lichens Peltigera spp. A new section on creating a brash pile has been added to the Habitat entry on Gardens. Some photos have been added to the Praying Mantis Mantis religiosa entry. A new entry has been added for Reed Beetles Chrysomelidae. The entry for Loose-flowered Orchid Anacamptis laxiflora has been updated. A link to a recent Guardian article reporting on bird song research has been added to the Nightingale entry. Nightingale's win the prize for largest range of notes. A la cuisine hier: Falafel, Baba Ganoush, Salsa -- served with Turkish flatbreads, julienned carrot, spicy red cabbage, char grilled red peppers and lettuce. Followed by homemade chestnut icecream. Taken at 16.20 on 22 April 2006. Loire Valley Nature: A new entry for Nightingale Luscinia megarhynchos has been added. A new entry for Nuthatch Sitta europaea has been added. A photo has been added to the Lizard Orchid Himantoglossum hircinum entry. A new entry has been added for Short-tailed Vole Microtus agrestis. A photo has been added to the Habitat entry for Roadside Banks, Verges and Ditches. 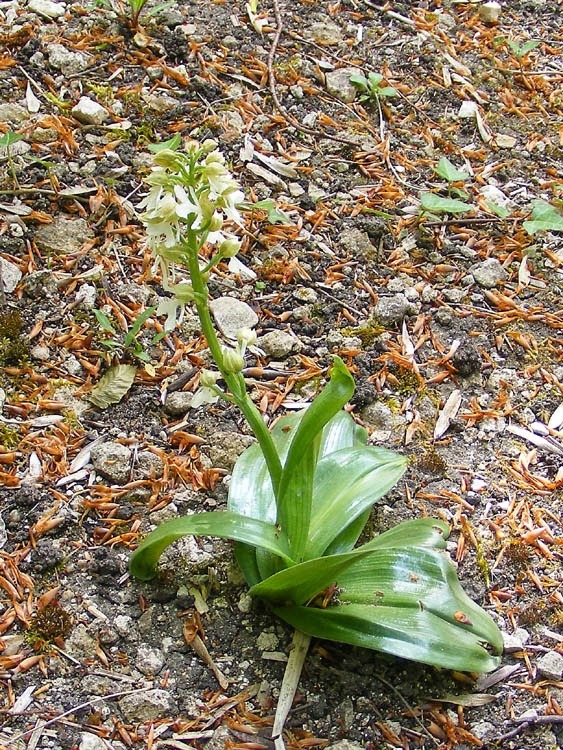 The same photo has been added to the entry for Military Orchid Orchis militaris, and to the section on the Association de Botanique et de Mycologie de Sainte Maure de Touraine in the Resources entry. A section on managing semi-natural grassland in gardens or orchards has been added to the Habitat entry for Gardens. A la cuisine hier: Oeufs coccotte au saumon -- light but filling. An Organic Market Garden: For those of you who read French there is an article in the Nouvelle République about an impressive sounding organic market garden at Montreuil en Touraine. Apparently they produce 750 veggie boxes a week, containing on average 3 kg of produce each. They are delivered to households in a 40 km radius. 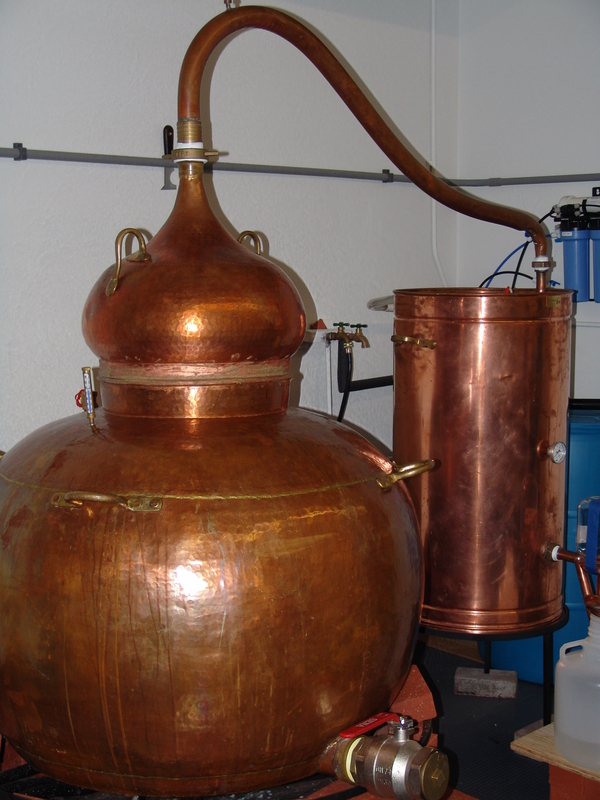 Total production is around 2 - 3 tonnes a week, distributed to retailers in Tours, Blois and Paris. Horses are used to hoe the rows and the enterprise employs 15 people full time and 45 people part time. The part timers are unemployed people being trained to get back into the workforce. The farm has been going 20 years and is called La Ferme de Roucheux. 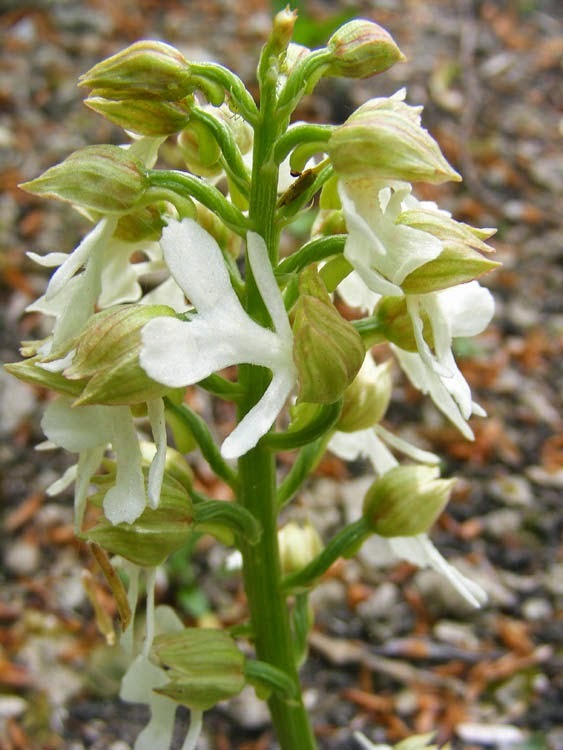 This green and white Lady Orchid Orchis purpurea was photographed in the grounds of the Chateau of Cheverny. 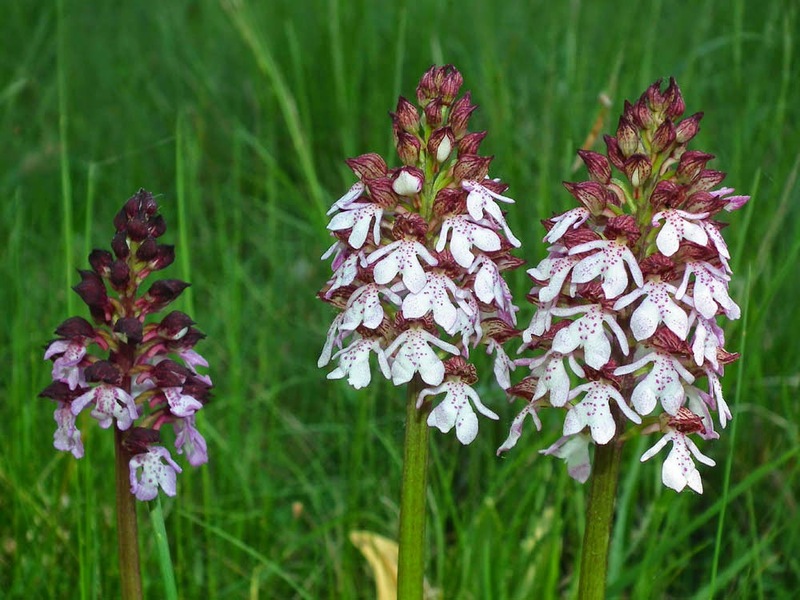 Lady Orchids are normally browny purple and pink. A specimen lacking much of the normal pigmentation like this is said to be hypochromatic. Last year I photographed a hypochromatic Bee Orchid Ophrys apifera. The condition is a naturally occuring mutation. A la cuisine hier: Spicy Cheesy Soda Bread -- fromageophobes will be alarmed to learn that the recipe took a whole block of cheddar (many thanks to the cheddar fairies who keep me supplied). Make sure you grease the tins well and leave the loaves cooling in the tins for about 10 minutes before attempting to tip out (but don't let them get cold in the tin). We went to the 8 mai ceremony yesterday morning, and by curious coincidence, there was smoked salmon or olive savoury cake, served with sparkling wine. The recipe above would be called something like cake aux lardons et fromage in French. I used my new found breading skills on some dos de cabillaud (cod back) and made oven fish and chips, with homemade chunky chips. 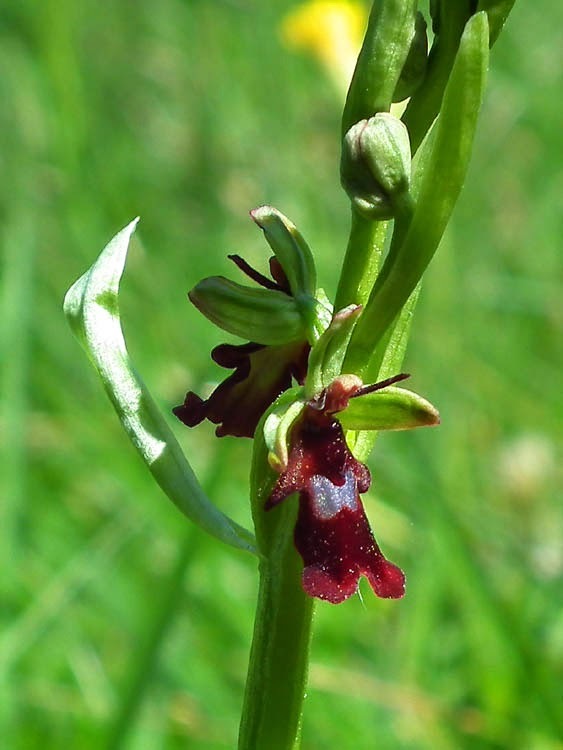 Loire Valley Nature: A new entry which offers an overview of the hybrid orchids in the Touraine Loire Valley has been added (at the request of Tim). There are photos to compare hybrids with their parent species, including close ups of individual flowers. A new entry for Narrow-leaved Flax Linum tenuifolium has been added. 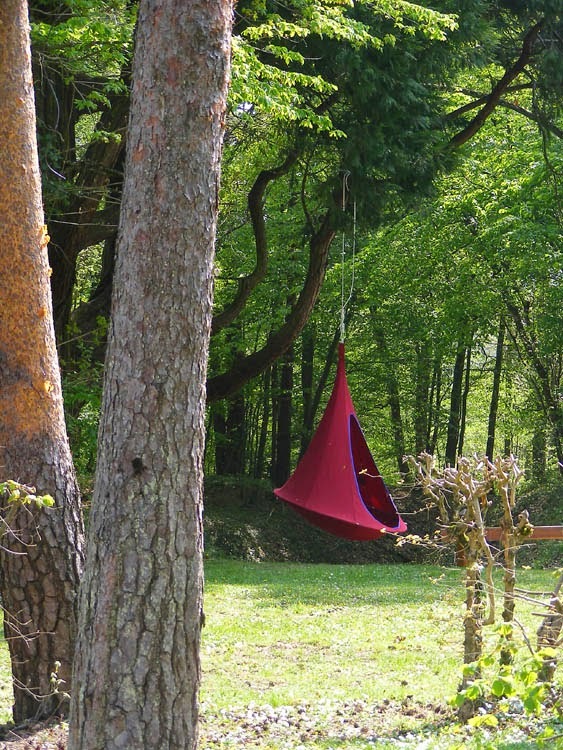 The Chateau of Candé has an extensive park surrounding the house, which is carefully managed to maximise and encourage biodiversity. Some of the proof of this is evidenced by the large colony of wild native orchids which pop up on the grassy slope behind the chateau, and in other places in the park. When we visited on 17 April there were 5 species and a hybrid in flower. Later, several more species will appear. Here is a selection of photos that Simon took on the day. Monkey Orchid O. simia (or more likely, a common naturally occuring hybrid Lady x Monkey O. angusticruris). Preuilly Restaurant News: Local readers may have noticed that La Claise restaurant has re-opened, with new owners. Previously it was a popular pizza restaurant, which closed under rather sad circumstances, then it had a brief incarnation as El Dorado before closing again for a while. The exciting news is that the new owners are experienced restaurateurs, and had a Michelin star at their previous restaurant, in Saint Savin. The new Claise offers an excellent value daily changing €12 lunch menu of starter, choice of two mains, cheese, dessert and wine. There are other menus, the most expensive of which is €31 I believe. We haven't been yet, but friends John and Alice reported at length and enthusiastically to us yesterday. They recognised the owners from Saint Savin, but apparently they originally come from Charnizay. A Restaurant in Bracieux: We had lunch on Tuesday at the Café de Commerce in Bracieux, near the Chateau of Chambord in the Sologne. It was an entirely positive experience costing a grand total of €37 for the two of us. We chose the Buffet Complet menu, which gave us unlimited access to the starters buffet (patés, terrines, salads, cured meats and fish), the generously stocked cheese platter and two desserts each from the dessert buffet. We added a 25cl pitcher of Touraine gamay and coffee. No main course with this menu choice, and no need for one! Simon was most taken by the menus options which offered three desserts per person for €5 (or buffet starter and two desserts for the same money). The food was attractively presented and delicious. The dining room was absolutely packed, mainly by remarkably hunky masons. Bracieux is full of rather smart restaurants, several of which have very good reputations and are rated by our friends, but we didn't feel we had chosen unwisely by taking the more workman friendly option. Chambord Report: We had time on Tuesday to spend an hour or so at Chambord, so can report that the roof restoration is coming along nicely. The end nearest the carpark has been cleaned and repaired, the middle section, including the cupola for the famous staircase is swathed in scaffolding, and the far end yet to be done. It probably slightly spoils some people's visit and mars their photos, but it could be worse. The scaffolding isn't covering everything, only certain sections. There is a sign saying that the work is definitely going to be finished by the end of the summer. We also tried out one of the 4 seater pedal powered vehicles they call Rosalies. They are €20 to hire for an hour. Unfortunately we got about a third of the way around the chateau and the pedals on my side stopped working. Oh dear... poor Simon got more of a workout than he planned for. Frankly, I thought it was expensive and noisy, and would suggest that you hire individual bikes instead, or simply walk. Loire Valley Nature: A new Habitat entry for Roadside Banks, Verges and Ditches has been added. I have updated the page on Butterfly Surveying in France with a section on how to choose the dates of your survey. The information is based on a recent communication from Luc Manil, who co-ordinates the project. A la cuisine hier: Grilled sausages, jacket potatoes cut open and slathered in butter, and spicy red cabbage. This last is more like a relish than a vegetable accompaniment. It is made by layering shredded red cabbage, finely sliced onion and chopped garlic, chopped or shredded zucchini and a seasoning mix of ras al hanout, ground coriander, ground allspice, 5 spice, brown sugar, salt and pepper in a large pot. Pour over some apple juice (or in this case some leftover and unimpressive pomme kiwi) and red wine vinegar and simmer for 3 hours. One cabbage will yield about 15 servings. Divide into batches and freeze what you are not eating immediately. Pollinators are Like Cyclists: Richard Jones meanders his way through a thought process and comes up with some nice similies and a good overview of the situation -- why we need pollinators and why the focus should be on resilient environments. Read it here. Surf's Up at Chenonceau Again!